﻿ Real Madrid 5-0 Athletic Bilbao. Dancing with the stars! 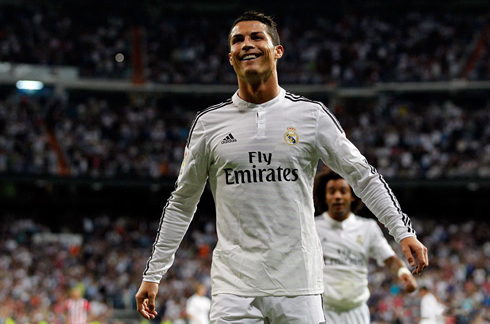 05.10.2014 » Real Madrid 5-0 Athletic Bilbao. Dancing with the stars! Real Madrid showed no mercy to Athletic Bilbao in their league fixture played this Sunday night and quite simply decimated the Basque side with a 5-0 win. Cristiano Ronaldo netted his third hat-trick of the season, while Karim Benzema scored his first brace of the campaign. 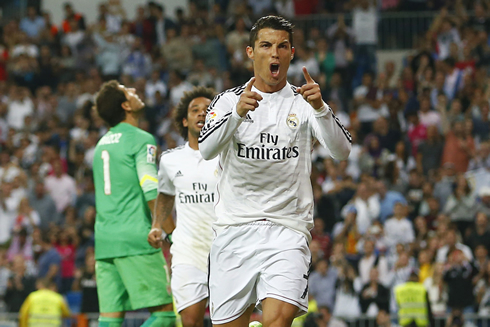 The Merengues wrapped up the 3 points and secured the 4th place in La Liga before going into an international break. Cristiano Ronaldo had another memorable night at the Santiago Bernabéu this past evening, after scoring a hat-trick and helping Real Madrid tearing apart Athletic Bilbao through a clear 5-0 win. Goals just seem to keep pouring for him and long-lasting records are being broken on a week on and week off basis! However and despite his brilliant display, Ronaldo wasn't the only player shining on the pitch last night. Karim Benzema finally scored a brace this season and his movement and understanding of his teammates around him were certainly very important for the Merengues to deliver one of the best, if not the best, performance of the season. Real Madrid's next game is against Levante on October 18, as we're now about to go into an international break, where most of the first team players will be representing their countries in a couple of friendly fixtures and qualifiers. Portugal and Ronaldo will face France (friendly) and Denmark (qualifier) in the upcoming days. Carlo Ancelotti didn't rest any player going into this game against Athletic Bilbao and his starting line-up was actually very similar to the previous one he had already picked last weekend against Villarreal. The only change occurred in the defensive line, with Varane handing his starting spot to Pepe. Casillas remained in goal, while Marcelo, Sergio Ramos and Carvajal, together with Pepe, helped closing the gates at the back. Midfield was occupied by Toni Kroos, Luka Modric and James Rodríguez, who got to play behind the BBC attacking front formed by Bale, Benzema and Cristiano Ronaldo. The 2-0 came in just a few minutes before both teams headed back to the dressing rooms, as the hosts managed to score again but this time from a set-piece play. Luka Modric took a corner kick on the right attacking side and it was Karim Benzema who rose high in the air to finish it off with a strong header. The Frenchman is often accused of being too passive in these kind of plays, but he sure didn't show that this time around. In the 10th minute of the second half, the Merengues got to extend the lead to a 3-goal advantage and all due to a great attacking play involving the BBC. Benzema laid the ball over to Bale on the right, which allowed the Welsh international to exploit a lot of free space to run forward with the ball in his control. That's precisely what he did and shortly after he got inside Athletic Bilbao's box, he spotted Ronaldo in the middle and delivered him a perfect assist for an easy tap-in goal. The Portuguese forward simply doesn't miss these kind of chances and was more than happy to add another to his scoring tally with so little effort. Bilbao would still have to bear a bit more suffering though, since Real Madrid and Cristiano Ronaldo weren't exactly over yet. The 2-times Ballon d'Or winner completed his hat-trick in the 89th minute of the game and he scored this goal through a very unusual but unquestionably efficient hip deflection. It all happened when Pepe was trying to also get his name in the score sheet, but couldn't direct a shot that would end up up hitting Ronaldo on the way to Bilbao's goal. 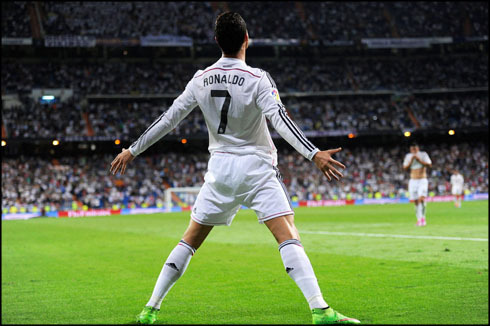 The result was an instinctive reaction from Ronaldo using his hip and Real Madrid getting their 5th goal of the night. 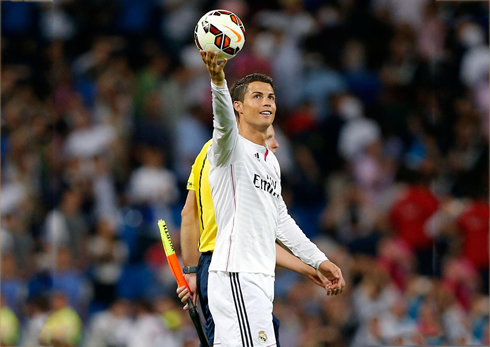 The Portuguese phenom has now tied Di Stéfano and Zarra's all-time record of 22 hat-tricks in La Liga. Cristiano Ronaldo next game for Portugal is a friendly international against France, on October 11 (Saturday). You can watch Juventus live stream, France vs Portugal, Slovakia vs Spain, England vs San Marino, Sweden vs Russia, and Poland vs Germany, all matches provided from our soccer streaming section.